this week we have some great old festival music by namphueng phetuthai & her group! the band includes suwan kaeonam, laiat lukuthai & sangwian miluenan, and though i've seen their cassettes stocked by a number of sacred music purveyors around bangkok, i haven't been able to find out a thing about them! i can however, tell you a bit about the music they are playing.. this tape is a soundtrack to the popular thot kathin & thot phapa festivals, two merit-making ceremonies which revolve around a community presenting new robes to their local monks. the recording begins with some unmistakable klong yao yodeling & long drum march. after a few tracks, namphueng shows up and sings about the festival happenings, with some beautiful piphat ensemble backing, and it all comes to a close with a raucous phin-driven klong yao finale. fantastic! 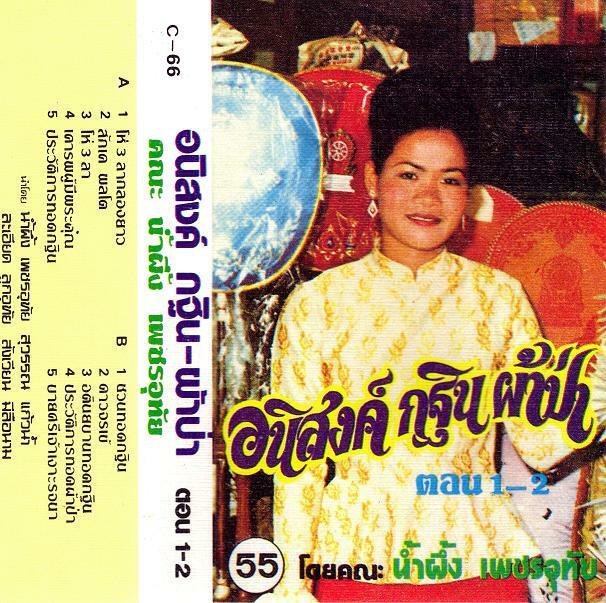 You can hear this fantstatic song on the DVD Phi Ta Khon, Ghosts of Isan by Rob Millis and Richard Bishop on Sublime Frequencies. Thanks for all those great cassettes. i just assumed it was a similar klong yao troupe, but listening again on youtube, it seems to be this exact recording.. good catch! where i can get more klong yao like the one track here and the siamese temple ball lp? i can't stop listening! any help would be greatly appreciated!